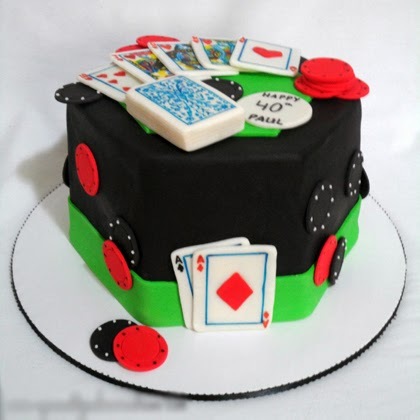 This fun poker table cake was created for a 40th birthday party. It was very unique and in several aspects a first for me. It is a hexagon shaped cake but inside there are actually two different cakes. There is a vanilla bean cake layered with raspberry filling and marzipan and iced in raspberry buttercream (see below for “inside” pictures). On top of that is a chocolate fudge cake with chocolate ganache filling and icing.